Our daycare services are for babies and school children. "Our Story Shelf" offers regular memberships & conducts story telling sessions for kids. We offer our space for Birthday parties and events. We conduct holiday camps during summer holidays. We offer our space for after school & weekend activities like gymnastics, art, kickboxing. The Green Pocket in literal sense is a pocket of greenery and lots of enthusiasm in the very heart of Bangalore !!! But for me it is synonym to a second home. As a storyteller I have worked with Our Story Shelf, TGP's library for Children. My association with Anhaita & Sulagna is not more than 18 months but it feels like I have know them for a while. The entire team is so supportive and enthusiastic almost always. Looking back at my journey with TGP and OSS, there have been many instances when I just have a vague idea or a very different concept and the team has lapped it up and created so many beautiful events. I am happy to have been associated with Anahita and her team !!! Thank you for the wonderful afternoon. Everything went really well and Sam throughly enjoyed it.The posters/banners were a great idea but Sam was very sad to see that some things had been written on the banner that were not very nice at all. I should have supervised this. It might be a good idea to encourage this to be supervised. We tried to remove the writting with nail varnish remover but it just made things worse. The activities were great and were enjoyed by both the boys and the girls which is always a tricky balence to get right but you managed it! The food was really tasty and the kids ate really well. I think they liked the look of the meatballs but it was a little too hot for the kids . The frying pan for the lollipop chicken should have gone on to a side table .Away from the table where the kids were serving themselves. Having the animals was lovely and my elder daughter loved the dogs So thank you very much for the lovely time we had I'm just sorry my husband missed it. Dear Anahita, The party was great, everyone spoke about it. The guest enjoyed all the stalls and games . Thanks for all the memorable moments. It would not have been a great show without your support. Thanks a lot . You made it really special for us. Hi Anahita, we would like to thank you for the good birthday party. Eerything was nice. The guests liked the food as well as the glass painting. Some of the kids went gaga over the dogs. All in all we all had wonderful time. keep it going. All the best to THE GREEN POCKET. A little oasis in the busy bustling city of Bangalore.” The first time I visited Green Pocket, I fell in love with the place, the beautiful trees, the fragrance of Earth, the animals....as my interactions with Anahita increased I fell in love with her beautiful generous heart. My son was at Green Pocket for 3 years....for us it has been our last extended family, our support through emergencies and a place of celebration. May you always keep shining Anahita!!! My daughter Mira was just one and a half when she started in Green Pocket. We were looking for a suitable place for her to spend a few hours each day. When we went to see the space we fell in love first with the warmth of Anahita and then the great green space she had created. A tree house, reading and music under the trees. The idea of playing with the earth and the charm of the open air drew us in. Mira had an enriching time in Green pocket. She started to learn her alphabets and sing songs. She planted flowers and went on short day trips that she thoroughly enjoyed. Lovely teachers and a personalised curriculum helped her a lot. We will cherish her time there! I have known Anahita and The Green Pocket for several years now. I have always loved the place and in 2014 I asked Anahita if I could conduct a sale for the "Mums of Bangalore". She kindly let me use the space and it was a great success. We had lots of different stalls selling various items from Chutneys to designer dresses for children. We also set up lots of activities for the children who had a blast! The space and ambiance was perfect for such an event and I shall always remember the kindness Anahita and her team showed me throughout the organisation stage. We began our journey of Event Planning with the Holi Party (2017) at Green Pocket. The venue for us was a peaceful piece of land in the heart of city, with strong characteristic of its own. The tree house in the center and the vast area surrounding it was the perfect setting for us to paint the town. After the success of our Holi Party we have couple of more events in association with The Green Pocket. The love and support we have received from Anahita and the team has been fabulous and we look forward to many such collaborations in the future. Truly.. a blessing for young ones.. in the lap of flora, fauna and great mentors.. Awesome place for kids!! Teachers are passionate about their work and the open outdoor environment is one of a kind!! Great and natural habitat for your kids to grow. My kid totally enjoy it. An awesome place to spend some quality time the adorable kids..
Its THE BEST that we gave to our kids..d learning d fun d creativity d freedom d love d care ... Everything.A place abt which i am very very confident.A team i really really trust.... Keep up d gud work.. U mean a lot to Us.. I recommend 'The Green Pocket' to every parent who wants their child to grow up surrounded by nature, The Green Pocket is a piece of paradise in this concrete jungle! Great job Anahita, may you guys grow from strength to strength. I have worked with Anahita closely on a lot of occasions in the past 2 years and I have found her to be a true professional wih excellent work ethics. She shares an excellent rapport with all her clients. She is very organized and extremely prompt on committments. Her passion for children needs mention and she is always full of energy when it comes to organizing activities for them. 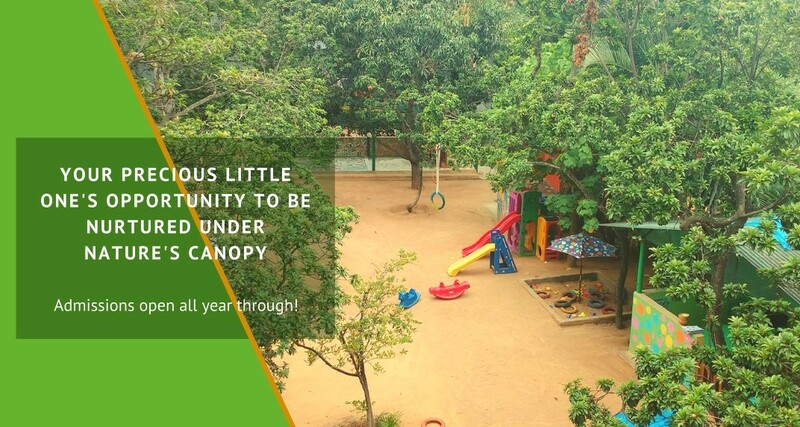 She has one of the best settings for a preschool in Bangalore, in an outdoor environment. I wish her the very best in all her future endeavours. Anahita's summer camps at the Green Pocket were very well organized with innovative and creative activities. Also, all activities are outdoors which makes this different from other camps that stay indoors. Anahita is hands-on and very warm and friendly with the kids. A great environment at Green Pocket. She also has a treehouse and kids can take their bicycles there for the duration of the camp. Highly recommend. Green Pocket is one of its kind of Pre-School in Bangalore. With an open air classroom set-up, it doesn't confine the young minds within the parameters of 4 walls. The entire team at green pocket is well trainned and pays quality attention to all the children and help them learn new things at ease. I am very happy to choose green pocket for my son's pre school education. My daughter completed her PlayGroup with Green Pocket & it was an amazing experience for all of us. Even though its almost a year since she moved out to join another school for her Nursery, she still has very fond memories of the place & the bond that was created with the teachers & staff. At Green Pocket, we always dealt with an extremely professional group of people who were personable as well, making it a great combination for a PlayGroup school. The team is very creative & both my wife & I are extremely happy with the outcomes we saw at the end of the session. Anahita's Green Pocket is a wonderful place where little children can explore and learn the way they are meant to - in an open and peaceful environment, with plants and animals and picnics and lots of fun and laughter. Anahita lovingly takes care of each child and his / her different needs with enthusiasm. Anahita has a magical way with little children. It is evident that she takes care of Green Pocket with tremendous passion. The happy children of Baby Nest Program as well as various Holiday Camps are a testimony to that. My daughter who went to Green Pocket when she was 18 months old thought that it was her second home. Now she waits eagerly for the Green Pocket Holiday Camps. Anahita's creativity and enthusiasm set The Green Pocket apart from soulless chains of playschools and summer camps. She always had fun activities planned, and the friendly space at the school also lends itself to hours of fun in the sun (and shade). My daughter and her friends always had a great time at the Green Pocket, whether in the summer camp or on her birthday party. When we saw this place we just fell in love with it. The open space, the pets, the trees and slides. It was all we wanted for our baby and more. The care and attention Anahita and the lovely teachers at TGP give the children is heart warming. Our little one has blossomed under their care and loves going to school. Hats off to the entire team at TGP! We celebrated my son' s 2nd birthday at The Green Pocket. The place is awesome. Lots of things for toddlers to remain engaged in. Slides, pets, trees, sand pit, a tree house. The kids had a blast. I would totally recommend this place for holding a kiddie birthday party. Anahita is extremely accommodating and made sure every little thing was taken care of and was very helpful and friendly. I only wish e stayed close enough so my child could have attended the preschool here. An environment the. kids will love and thrive in. I did a lot of research and toured several daycares before finally choosing Green pocket. My criteria for selecting a daycare were: 1) friendly, capable, trustworthy staff 2) clean, bright facility and 3) reasonable price. I especially appreciate the daily feedback provided by the staff on his daily activities and the genuine interest they exhibit in seeing him thrive. Overall, green pocket fit the bill on all of my needs and my son learning there. My kids attended holiday camps at the Green Pocket with Anahita a few times. Both LOVED their time at Green Pocket. From the open space to the activities - you couldn't ask for a better time for your kids in Bangalore. Anahita is such a great person and so caring towards the children - I always felt 100% confident dropping them off with her. Every interaction I have had with her reinforces my impression! She is inclusive, gentle yet firm, and tons of fun. And she instills the same values in her staff. Last Month we arranged for my son's birthday party in The green pocket. The set up, lunch arrangements and the ambience itself were spot on ! The only let down was the games facilitator- he was an amateur, hence inexperienced in handling the kids. Being an open space with ample place for kids to play all the kids enjoyed a lot.. Most of the kids were 5-7 age group and there were around 25 of them with their parents - so we had a gathering of around 60 people (including the kids). The space was comfortable for everyone to mingle and move around at the same time give enough space for kids to play around. Am glad that we made this choice. My son was thrilled and enjoyed a lot, so did all his friends. Highly recommend to anyone looking for an open space for birthday parties. Thanks Anahita (owner green pocket) and team and Dinakar (Caterar) for your fabulous arrangements !! Green pocket is a little nook of pure joy! It is a place which encourages kids to be kids at a time when we expect them to be young adults from the day they are born! I was extremely impressed with well planned and executed summer camp "Fun Under the Sun". The activities and field trips were meaningful. The staff and volunteers were caring and engaging. My son especially enjoyed going to the Old Age Home and performing and spending time with so many “Grandpas and Grandmas”. He also thoroughly enjoyed painting the walls/ shed of Green Pocket. He was sad that he could not attend the Camp in 2018 and has taken a written promise from me to attend in 2019! Thank you for the wonderful experience Anahita!